Ohio landowners recently traveled to Washington, D.C. to discuss the continued Bureau of Land Management (BLM) delays that have resulted in a seven-year prohibition of oil and natural gas development on private acreage adjacent to and under the Wayne National Forest. As Abbott described, six townships in Monroe County have 92,095 acres that include 22,981 acres of Wayne National Forest and 22,981 federal surface ownership acres – the federal government only owns mineral rights for 9,192 acres, or 10 percent of the total acreage. 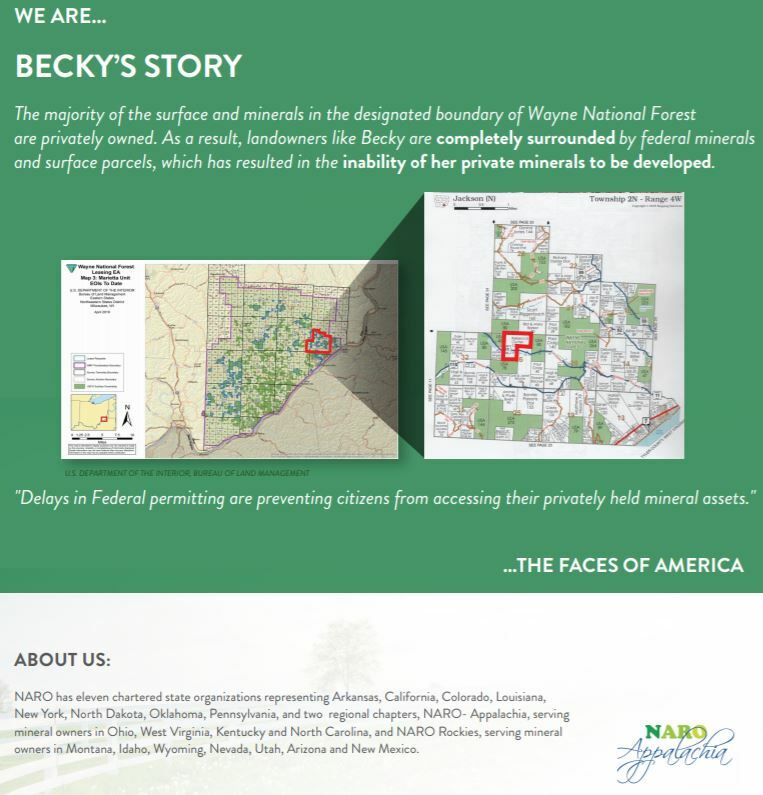 In other words, thousands of landowners are surrounded by Wayne National Forest parcels of land and subsurface federal minerals. Notably, the proposed drilling units will have no surface disruption to the Wayne National Forest, as well pads will be constructed on adjacent private lands. Further, NARO and LEASE members allege that the BLM is requiring environmental assessments on adjacent private lands, an action that landowners believe is federal overreach. It appears that at least part of the reason for these delays has been a lawsuit the Center for Biological Diversity (CBD) filed against the BLM in May 2017. EID found that not one Application for Permit to Drill (APD) has been issued by the BLM since the CBD lawsuit was filed. The BLM did, however, issue two permits in 2016, prior to the October 2016 final Environmental Assessment for Oil and Gas Leasing, Wayne National Forest, Marietta Unit of the Athens Ranger District, the succeeding December 2016 federal auction lease sale and months before the CBD lawsuit. In addition there have not been any lease sales of federal minerals since March 2018, although one was scheduled just this week for September. About two months after Chairman Rob Bishop’s hearing, the U.S. Department of Interior issued an updated Permanent Instruction Memorandum No. 2018-014, which included significant changes to its regulations for well pads situated on non-federal land that directionally drill into federally-owned minerals – which is exactly the case for the Wayne National Forest drilling units mentioned above.. However, it is unclear if the instruction memorandum will allow BLM to issue permits or if the litany of CBD lawsuits against the agency will result in even further delays. To date – even with the new Instruction Memorandum – the BLM has not approved any pending APDs. And that is why the landowners and elected officials in Monroe County are so upset with the current situation. Oil and natural gas production in the Wayne National Forest is not new. In fact, there are currently over 1,200 producing conventional wells on the surface of the forest. Oil and natural gas production from existing wells pays a royalty to the state government, with a portion going back to the local governments within the boundaries of the Wayne National Forest. For example, the annual mineral payment to local Ohio governments and communities in 2003 – nearly a decade prior to Ohio’s first shale well – was $14,822. Today, thanks to the discovery of new shale reservoirs, Ohio’s oil and natural gas operators have paid over $8 million just to lease federal minerals – that doesn’t even include possible future royalty payments. The contrast before shale and after, as it relates to mineral payments from lease sales and royalty payments is simply staggering. As you can clearly see, the annual mineral payment was $14,822 prior to shale in 2003 compared to $645,328 distributed today. That’s an increase of 4,253 percent since 2003! According to landowners, those mineral payments could be far higher if more federal auction lease sales were made available, and more importantly, if these federal minerals were actually put into production – which is precisely why landowners and the local Wayne National Forest communities are concerned that these ongoing delays may be devaluing minerals in the region.